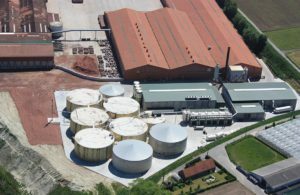 Plant description: AM-Power is the largest biogas plant in Belgium and has a treatment capacity of 180 000 ton. The organic waste streams originate from the intensive agro-industrial activities (manure) and associated food industry. AM-Power is located in the Northern part of Belgium and this region is characterised by an excess of animal manure and yet a high market demand for formulated synthetic fertilisers. This implies that within the same region (as is illustrative for many similar agro-industrial regions throughout Europe) nutrients present in raw slurries, have a negative value, whereas synthetic fertilisers are in high demand enjoying a positive value. Innovation: AM-Power will implement a evaporator and reverse osmosis system for the production of mineral concentrates from bio-waste. AM-power will demonstrate that the production of concentrated liquid fertilisers by NRR technologies is economically profitable. Products & Benefits: The process produces liquid mineral concentrates, rich in N and K, that can be used to replace synthetic mineral N,K fertilisers.